Edinboro journalism students learned about their prospective field, first hand, from a professional reporter in Compton Hall 107A on Wednesday, Nov. 28. 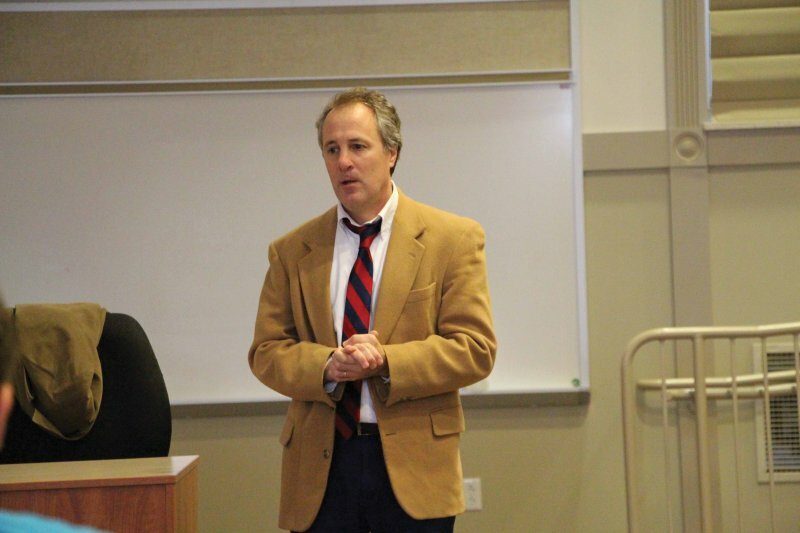 Ed Palattella, an investigative journalist with The Erie Times-News for nearly 29 years, spoke with students and guests about his experiences in the field. Specifically, he talked about his coverage of the child abuse scandal that rocked Pennsylvania and involved the Erie Catholic Diocese. The larger issue of child abuse in the Catholic church was first exposed in the early 2000s, when journalists at The Boston Globe exposed the church and their efforts to cover up for priests who abused children. The issue was then reignited in 2015 with the Oscar-winning movie “Spotlight,” starring Mark Ruffalo and Michael Keaton. However, the issue sustained in the U.S. for years, with rumors that it had spread to the Pennsylvania diocese. This begged the question: could it happen in Erie? That was what The Erie Times-News set out to answer. The news team started out their investigations by asking the Diocese directly, but it didn’t work at first. According to Palattella, former bishop of the Erie diocese, Donald Trautman, was not very forthcoming. “It quickly became apparent that the Diocese was going to stonewall us,” he said. Then it occurred to Palattella that while they couldn’t look at the church’s private documents, they should look into their directories, which are very thorough and open to the public. “Everything is in writing,” he said. From there, they studied the directories as far back as the 1960s, going year-to-year, looking at every priest and looking for those who were pulled from active duty and placed in administrative roles apart from a church (in what is called special ministry). “If a priest was absent from one year to the next, we figured something bad happened,” he said. These patterns helped them to identify specific priests or clergy members, discovering that potential abuse went high up in the Erie community. One of these big names was the late Dr. William Garvey, former president of Mercyhurst University, who was, according to Palattella, an “icon” in Erie. However, he was previously accused in 2004 of the same charge, the Times-News writer explained, but it was largely ignored due to his influence. When the newspaper reported this, they apparently received backlash and many letters to the editor telling the team they were wrong. As it turned out, they were right; on Aug. 14 of this year, a Pennsylvania grand jury report was released, detailing the hundreds of priests credibly accused of abuse in six of Pennsylvania’s eight Catholic dioceses. This prompted the Erie diocese to release their own list of names. Garvey’s was one of them. The grand jury report and the church’s list, according to Palattella, changed everything in their reporting on this issue. “Once that came out, now people are more willing to talk,” he said, adding that priests who previously denied involvement then conceded and apologized as a result. In addition, Palattella was impressed by the turnaround with Erie’s current bishop Lawrence Persico, who has made it easier for reporters with his transparency on the issue. One thing that never gets easier, though, is talking to the victims of abuse. “Talking to victims, trying to persuade them to come forward . . . they’re difficult stories,” Palattella said. The reporter finds that with difficult stories like these, it’s easy to get emotionally involved. However, it is the duty of a journalist to do their best to avoid this. “You just have to step back and realize that if you let your emotions get the better of you, [you risk] overreaching and going beyond the evidence you have,” he said. Bishop Persico visited Edinboro University on Tuesday, Dec. 4 at 7 p.m. to talk about the scandal as part of the “Uncomfortable Conversations” series. The talk took place in the student center multipurpose room and was moderated by Pittsburgh Tribune-Review reporter Debra Erdley. Nathan Brennan can be reached at edinboro.spectator@gmail.com. With the end of another semester comes the end to another season of theatre at Edinboro. Presenting shows such as “The Musical Comedy Murders of 1940,” a night of “Jokes and Dagger” improvisation, “The Addams Family Musical” and a night of “One Acts,” it was a varied experience in spring 2019.